Cuchillo Azero con hoja de acero ACX-380 cuya longitud es de 82 mm. y su longitud total es de 205 mm. Posee un mango de 123 mm. con cachas de mikarta canvas y un peso total de 160 grs. Viene presentado con funda de cuero y barra de magnesio incluidas. 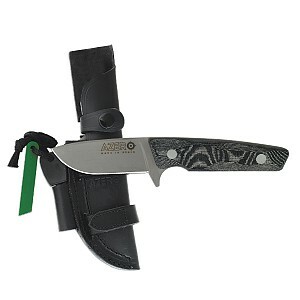 Azero knife with a ACX-380 steel blade whose length is 82 mm. and has an overall length of 205 mm. It features a 123 mm. handle made of mikarta canvas and an overall weight of 160 grs. It is presented in an included leather sheath and magnesium bar.